When Peg McMahon first arrived at Morrill Tower her freshman year in 1966, the 24-story residence hall wasn’t exactly move-in ready. In fact, the top 10 floors were still under construction. The sidewalks weren’t poured yet, so slippery wood boards and mud lined the walk to and from her dorm. Bed frames weren’t delivered until a week into the quarter, so McMahon and her 15 suitemates slept with their mattresses on the floor. Dining services wouldn’t be added for some time, so students would hike to North Commons twice a day for their meals. Although construction on Morrill and its twin, Lincoln Tower, wouldn’t be finished until the following year, a lack of rooms in other dorms forced the university to begin housing students there anyway. The completed Towers officially opened to students in 1967, according to a September 1967 OSU Monthly article, marking this year as the dorms’ 50th anniversary. While the Towers might be seen today as relic of the past, the West Campus residence halls were modern for their time. Construction of the Towers began in the mid-1960s. With a growing student body and limited space to house them, the university started crafting a plan for new housing options. Originally, six identical towers were slated for the banks of the Olentangy River, as well as a student union and a boathouse, in hopes of creating a focal point along the river. Where to build the first two towers, however, became a topic of controversy among the campus community. Because of its proximity to the river, power lines and utilities would need to be built and relocated to service the new dorms. It’s unclear as to why exactly the other four towers were never built, but Lincoln and Morrill quickly became iconic on campus upon their completion. The Towers have had their fair share of noteworthy residents over the years. Ohio Gov. John Kasich lived in Morrill during his time as a student. Infamous serial killer Jeffrey Dahmer also resided in Morrill for a quarter, before flunking out of Ohio State in 1978. Most notably, The Towers were the first permanent coed residence halls on campus. Morrill was originally designed as a women’s hall and Lincoln for men, but John T. Bonner Jr., former executive dean of student relations, said the coed program would be a “worthwhile experiment,” according to an October 1966 Lantern article. The experiment did not come without controversy. McMahon remembers nicknaming the Towers “Sodom and Gomorrah,” after the biblical cities known for their rampant sin and sexual immorality. At a time when women living on campus had curfews and their male classmates did not, McMahon said it was contentious among residents. The university began phasing out curfews in years to follow. The Towers’ suite-style living was the first of its kind on campus. While some students today find this style too cramped for their liking, others prefer the sense of community the Towers provide. Delia Hudson, a first-year in accounting, said she was pleased to hear she would be living in Morrill Tower for her freshman year. Elizabeth Morris, a first-year in exploration, said she hoped to get placed in one of the towers after seeing her brother, who also lived in Morrill, have such a positive experience. McMahon can attest to that. Even after 50 years, McMahon said she still keeps in touch with many of her suitemates and friends from her first years in the Towers. Jacob Myers contributed to this article. Next: So, what’s the deal with the crops near Smith Lab? 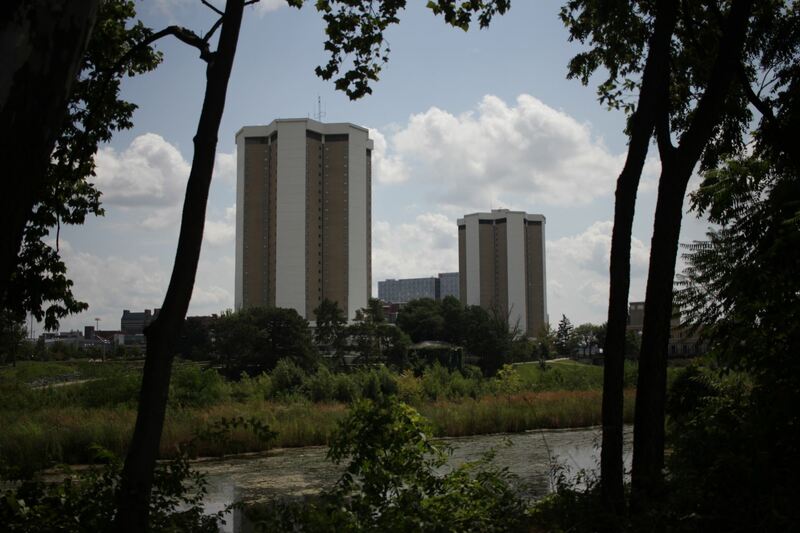 A great article about the towers….An Ohio State Landmark! Lived in 2021 Morrill in 1972-73 and 833 in 1973-74 where I met my future wife and best friend. Maybe the OSU Alumni Assoc. should schedule a reunion for all past Tower Residents! We did go back, back in the July 2000 for our daughters OSU Orientation and stayed in Morrill but not in the same suites we occupied back in the 70’s! What about the fire set by an emotionally disturbed woman in the 60’s? That was a very significant event in the history of the Towers.